Otosome - Rows of 'Midnight' edition is provided exclusively for the luxury sedan Nissan Maxima SR models just released by the automotive manufacturer headquartered in Yokohama, Japan. Views of the State Sakura luxury sedan is now more sweet and cool new trim body wrapped in a special edition of a special 'Midnight' earlier. Its exterior is now decorated with a spoiler and a new rear diffuser which was closed by a burly appearance of alloy wheels measuring 19-inch. That's not enough, the inside of the cabin may also be a new touch more 'classy'. The atmosphere of luxury in the cabin of Nissan's luxury sedan filmed by a new patch with premium leather upholstery Charcoal enhanced by detailing Alcantara. 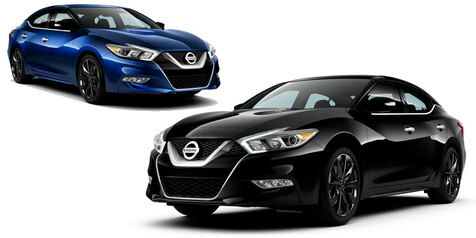 A total of 5 Maxima's exterior color options SR Midnight Edition presented for interested consumers. Namely Super Black, Pearl White, Deep Blue Pearl, Coulis Red and Brilliant Silver. Midnight Pack offered at a price of US $ 1,195 over the standard version Maxima SR is priced at US $ 37,770.